We are accustomed to haute couture fashion that is impractical, even improbable; we are also achingly familiar with Photoshopped fashion models who appear impossibly perfect. Where these two worlds collide, there is impossible fashion – garments and shoes that could never exist in reality. In an advertising campaign for her line of footwear, supermodel Gisele Bündchen is depicted wearing a dress made of water. We know that this garment is impossible. We do not have the technology to harness water into the shape of a dress without containing it in some sort of vessel. And yet, here is photographic evidence that it does exist, apparently clothing a woman who we know to be real. Gisele Bundchen appears to wear a dress made of water in promotion of her line of footwear. Photoshop exists to create the illusion of reality. Photographic media are regarded as able to provide “accurate transcriptions of reality”. When fashion photography first emerged, advertisers were keen to draw attention to the fact that their adverts featured “actual photographs” with the implication that past advertisements had used illustration to give consumers a misleading picture of a garment’s features. The first aim of this early fashion photography was to present subjects a genuinely as possible. Recent controversy over retouched beauty photos has shown us that appearance of a photography no longer “corresponds to reality”. Much has been said about the over-use of Photoshop in fashion photography, and the impossible role-models that are created for impressionable consumers. Increasingly, this digital manipulation extends to the garment. It appears to be common practice to Photoshop the garments depicted in fashion catalogues and on retail websites. Often, the various colour options are digitally overlaid on the final image, rather than photographed directly. A collection of unretouched images from the Victoria’s secret catalogue reveals colour changes and straps removed from bikinis. These garments are subjected to the same process, but not the same controversy, as models’ bodies and faces. Fabric is tucked and trimmed, smoothed and recolored, using the same Photoshop tools that are applied to a model’s skin and silhouette. Using CGI, it is possible to create a garment entirely from scratch, as if plucked out of thin air. Concept-Clothes are not limited by the laws of physics or technology. They can take any form, and can be cut from any substance. Some are designed with eventual manufacture in mind (see, for example, Julian Hakes’ Mojito shoes), and others are purely fantastical. 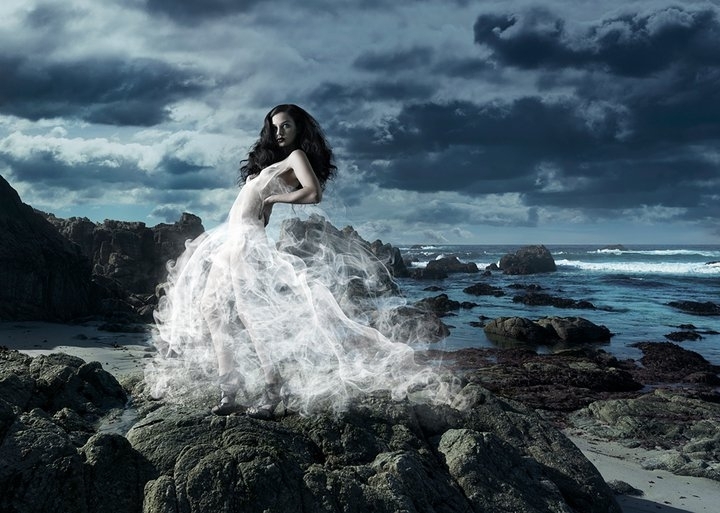 Juan Zambrano’s smoke dress (pictured above) combines couture styling with digital wizardry. Zambrano was directly inspired by the exclusivity of couture, and well aware that this image presents viewers with an image of something they can never have. The impossibility of these computer-generated garments means that no matter how much we desire them, we can never have them. They achieve a new level of exclusivity. Perhaps this is the ultimate in haute couture; fashion so exclusive that no one can have it. Price, Derrick, ‘Surveyors and Surveyed: Photography out and about,’ in Photography: A Critical Introduction, ed. Wells, Liz, London: Routledge, 2004, 68. Martin, Richard, ‘Fashion in the age of Advertising,’ Journal of Popular Culture, Vol. 29, No. 2 (1995), 242. Peirce, Charles, Collected Writings, Cambridge, MA: Harvard University Press, 1931, 58.